Kansas agriculture continues to be a vital force in the state’s economy, bringing in dollars and and providing many jobs. As the top industry in Kansas, agriculture accounts for over 40 percent of the total economy, and according to the most recent statistics, in 2012 there were 61,773 farms in the state, producing and raising top crops and livestock. The Sunflower State’s top commodities include cattle and calves, wheat, corn, sorghum and soybeans. The state’s nickname comes from another important crop, as Kansas ranks fourth in the nation in sunflower production. Kansas sits in the animal health corridor, which is the single largest concentration of animal health interests in the world. Exports are another major part of the industry, with a value of $4.9 billion in 2012. But Kansas agriculture is more than just crops, and includes agribusiness, research and education, food production and processing, renewable energy production, and lots more, all that help keep the industry viable. Kansas’ wine industry is gaining ground thanks to education, agritourism opportunities. Kansas Department of Agricultures put forth a growth strategy to expand and improve the state's thriving ag industry. Students with ag degrees have a wide variety of promising career opportunities to choose from. 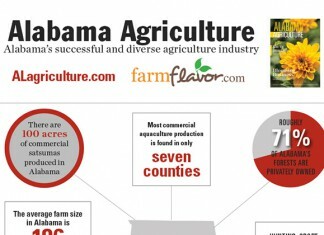 See an interesting infographic displaying facts and stats on Alabama's successful agriculture industry.